At least 52 persons were killed and 40 injured when an overcrowded private bus rolled down into a gorge near Rajera village, around 10 km from Chamba today. Taking serious note of reports of a �sense of insecurity� among Hindus in Sindh, Pakistan President Asif Ali Zardari has set up a three-member committee of parliamentarians to visit different parts of the province to reassure the minority community about their security. Three days after former Haryana minister Gopal Kanda was declared as an absconder in the Geetika Sharma suicide case, the police in Delhi as well as in Haryana remains clueless about his whereabouts, sparking speculation that the controversial MLA may be hiding under protection. 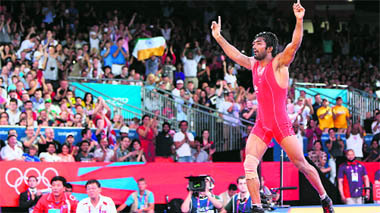 At 6.52 pm local time on Saturday, Yogeshwar Dutt, a man possessed, put his North Korean opponent through a frightening twister he likes to call 'phee-taale' � he'd got Jong Myong Ri by his feet and, in a breathtaking move, twisted and twisted him on the mat. As the clamour in the Congress for Nehru-Gandhi scion Rahul Gandhi to play a more proactive role continues unabated, Prime Minister Manmohan Singh today reiterated that his entry into the government would be a welcome step. Two persons were killed and 14 others including police personnel and journalists were seriously injured after those who had gathered in downtown Mumbai to protest killings in Assam turned violent. An increasing number of women run the risk of being raped or molested by acquaintances and neighbours. On Thursday, a Faridabad-based call centre worker was gang-raped. One of the assailants was known to her.